When you need a new septic tank, you want to have confidence in not only the system but the people who install it. It’s a big job that requires a significant financial investment, so it pays to work with a company that has a long track record of superior service. 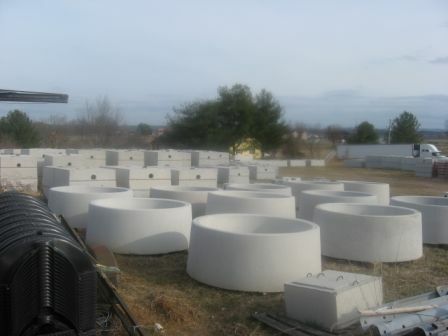 Wilson & Roy Construction in Nancy, KY, has been the leading concrete septic tank installation business in Pulaski County for a half-century, and there are many advantages to hiring their skilled team for septic tank sales and services. Wilson & Roy Construction has served the septic system needs of south-central Kentucky for more than five decades, so they know how to install a reliable product. Their knowledge of underground utilities lets them dig on your property and install your new septic tank safely and efficiently, without damaging pipes or power lines or causing unnecessary disruption to your landscaping. Septic systems aren’t a one-size-fits-all product. Depending on the number of people in your family and usage level, the size requirements for your new septic tank can vary widely. That’s why the team at Wilson & Roy Construction offers a variety of concrete septic tank designs and sizes, ranging from 750–1,500 gallons. When you hire a trenching contractor or septic tank installer, they’ll be working with heavy equipment on your property, so it’s crucial for them to be bonded and licensed. Wilson & Roy Construction is fully insured and bonded, so you can have peace of mind knowing you will be protected from liability if there’s a problem during your septic tank installation. The installation of a septic tank is complicated, but it doesn’t have to be a burden. When you choose a septic tank sales leader like Wilson & Roy Construction, you can be confident in the quality of their work. Call (606) 636-6457 to schedule service, and visit them online to learn about their range of new septic tanks and earth-moving equipment.